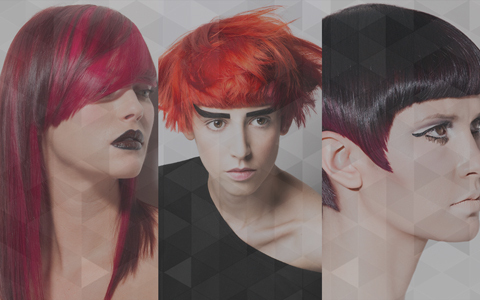 Christiano Lanza’s hair colouring video tutorial incorporates three levels of colour, with a panel through the sides inspired by the eyebrow line. Christiano provides information and tips on colour palette and placement and how to achieve even saturation. Following discussion with Tim Hartley, the hair is coloured before the haircut and a pre-bleach application starts the process before the reds are applied. The final result is a super shining, flaming Mars red with an interplay of violet tones adding definition and theatre to Tim Hartley’s dramatic haircut. Tim Hartley’s haircutting tutorial teaches how to cut an 80s inspired variation of a bob hairstyle with a rounded back and a clean open fringe to frame the brow and eyes. Tim demonstrates the positioning of curved graduation, over-direction and fringe placement and provides tips on suitability. The final result is a dynamic geometric shape, with a defining framing fringe and a rounded graduated back which throws back to a classic 1980s bob. The architecture of the shape is perfectly enhanced by the screaming Mars colour by Christiano Lanza in lesson 1. Tracy Hayes' colouring tutorial demonstrates a colour application following cutting by Tim Hartley in lesson 4. 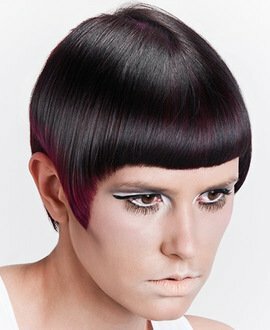 This bold application uses an asymmetrical section across the front of the head, framing the face. A base colour of deep red/violet tone is applied in the back area. The front area is pre-lightened with bleach in foil and lifted to a pale yellow, then a semi cyclamen pure tone colour is added. 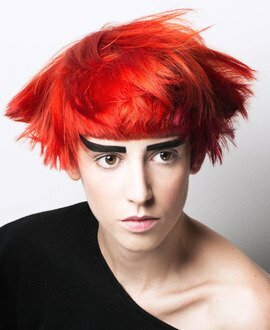 The result is a vibrant outburst of reds and pinks highlighting the bold statement haircut. Tim Hartley's advanced haircut tutorial begins with the outline in the back area, using a curved A-line shape to promote structure in the perimeter and side areas. Tim works the internal shape throughout the top area and blends the internal shape and outline together working naturally with the connection. 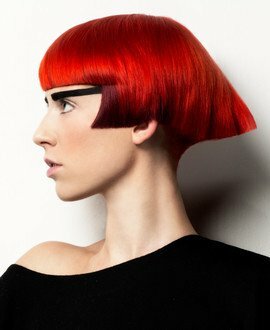 Tim finishes the shape by placing a bold fringe running from the lip line towards the ears on both sides to achieve this simple modern urban silhouette and provide a strong base for Tracy Hayes' bold colours in lesson 3. Charmaine Piche's colouring tutorial is a dark on dark two-tone colour to compliment and enhance the balance and shape of the 5-point haircut and contrast against the model’s warm skin tone. 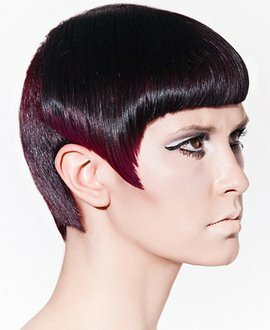 The process includes a Level 4 Red/violet tone on the underneath section and a dark element tone through the top area to strengthen the fringe and the side points and bring the shape together with complimentary colour. Charmaine completes the right-hand side point area with a bleached section toned with a vibrant red/violet pure tone providing a rich burgundy colour. The final result combines with the haircut to regenerate Vidal Sassoon’s classic 60s shape for the 21st Century. Stacey Broughton's haircut is his tribute to Vidal Sassoon and the iconic 5-point haircut. For his version, Stacey begins with vertical graduation tailored into the side areas. By balancing both sides with this shape allows you more control over the internal shape and creates the guide into the fringe and back area. Stacey carves the shape into the nape area to ensure the beauty of the head shape is controlled using the guides and the technique from the sides. The result is a bold modern interpretation of an historically important and groundbreaking haircut, expertly cut and sharpened by Charmaine’s Piche’s striking colour work.